That request would’ve sounded crazy 25 years ago. Now it’s the way many of us communicate. I like to text. It’s easy and fun and it often makes a lot of things more convenient, opening up time in my day to be more productive. Or to binge on a little Netflix. However, any form of communication has its pitfalls; even speaking fact-to-face can lead to misunderstandings, incorrect assumptions, hurt feelings, and worse. 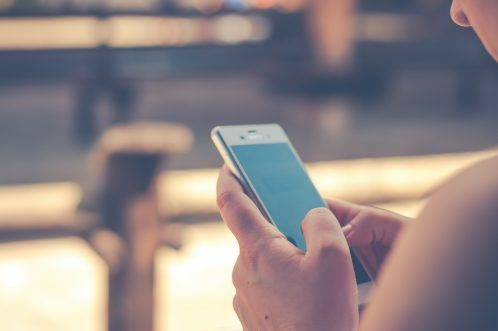 With texting we have the ability to reach out to someone about a particular issue without the time commitment of an entire conversation, it’s also true that at times receiving that chime indicating an incoming text can feel a little intrusive. You feel obligated to check your phone, and then to reply, even if that means taking your attention away from what you’re currently involved in, or worse, away from whom you’re currently talking. Can you get addicted to texting? Why? Because the flip side is, you know what it feels like to have someone not respond when you’re waiting for their answer. This can begin a spiral of negative self-talk if you become super-sensitive to what the lack of response could mean, when often, it means absolutely nothing. What’s fascinating neurologically? Dopamine is released when you’re awaiting a response — and what does dopamine do? It’s known as the seeking neurotransmitter. It’s released when you’re seeking something out that you anticipate being pleasurable. The more dopamine, the more seeking. Coupled with the other “pleasure” neurotransmitter, you’re addicted. So, what happens when you don’t receive what you’re hoping for? A couple of hours can turn, for some, into a sign of complete lack of interest. Non-caring. For people dating or playing around with the idea of a relationship, it can be the topic of endless, agonizing speculation about the meaning of the minutes or hours gone by. The analysis doesn’t stop there. If you see that they began to write, and then stopped? Those three dots are there but then that reply never materializes. Just what does that mean? It can get a bit overwhelming. If you’re a parent and texting your child, the lack of response can feed already hard-to-control anxiety, escalating into texts to best friends, or even a call to the police. And all because your child’s phone is dead. Once again. Or they are at a park, a concert, or with friends and a parental message is just not going to be a priority. Yet distrust is distrust, fear is fear. No matter how old you are. Emojis help interpretation, and can be used to help bring context to a conversation. But texting has no nonverbal cues and since they are sometimes sent impulsively, or perhaps when there have been a few cocktails served, that can be more than problematic. So all that is interesting, sometimes troubling, and something to be worked out, as texting increasingly prevails in our everyday lives. I wonder if people realize how much innate power the act of texting in front of someone else has on a relationship, when you’re in their presence. I had a young female patient, who was miserable here at our local university. She was from another state, and said that she could find no friends. She was, however, extremely close to her mother. I asked her what she did as she walked between classes. Let’s face it. The very physical act of texting detaches you from your immediate surroundings because you are hunched over your phone with your face down, eyes diverted from the world around you. You aren’t available to anyone around you; maybe you laugh at something someone sent and text them back, without telling whoever is with you what’s going on. Then there’s the issue of distraction, or just plain escape. There is a poignant sadness in seeing a family, or a couple, supposedly out for dinner and every one of them is on their phones. I never know quite what to think. Are they uncomfortable? Unhappy? Is there nothing to talk about? Do they not realize that time is a gift? Is the game they are playing, or the scores they are checking, that important? Maybe you are that family. We teach our kids about respect and connection through our actions. That includes how you text. What can it mean if your partner hides their phone? Discovering texts has become a prevalent way for people to find out about affairs. Even if it’s not sexual. 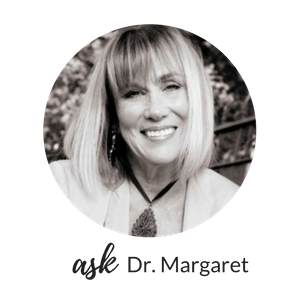 Maybe you are having a teasing, maybe flirty, fairly intimate relationship with someone else. But it’s a secret; you don’t share the conversations with your partner. 1. 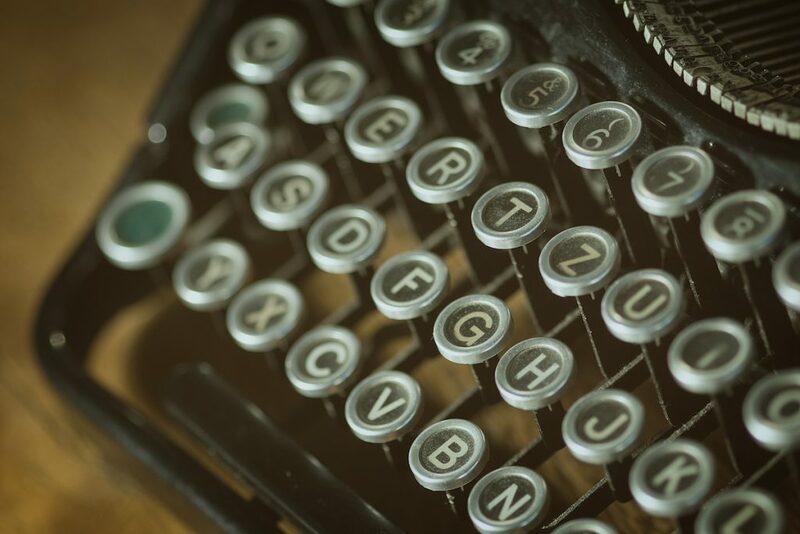 If you wouldn’t show what you are writing to your partner, then it’s better not to write it. 2. 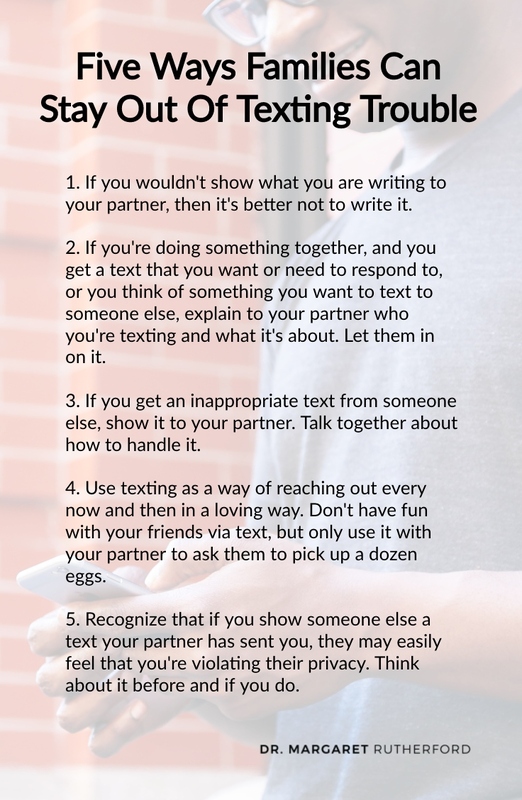 If you’re doing something together, and you get a text that you want or need to respond to, or you think of something you want to text to someone else, explain to your partner who you’re texting and what it’s about. Let them in on it. 3. 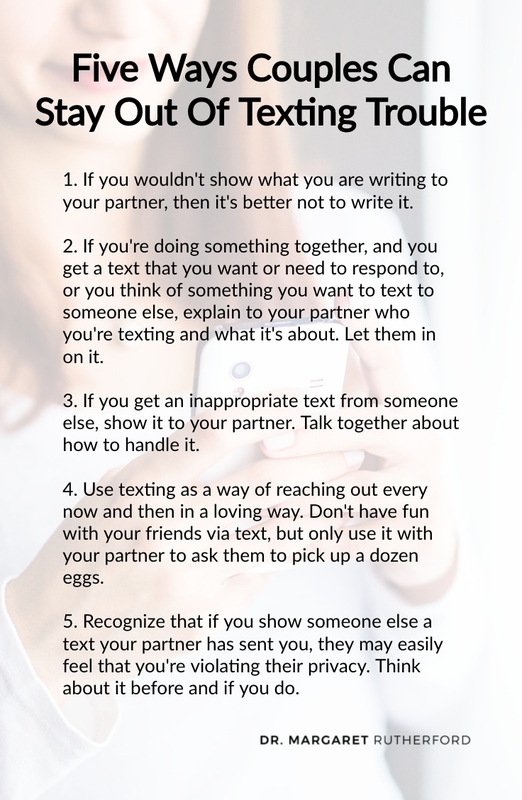 If you get an inappropriate text from someone else, show it to your partner. Talk together about how to handle it. 4. Use texting as a way of reaching out every now and then in a loving way. Don’t have fun with your friends via text, but only use it with your partner to ask them to pick up a dozen eggs. 5. Recognize that if you show someone else a text your partner has sent you, they may easily feel that you’re violating their privacy. Think about it before and if you do. 1. Establish times when technology takes a back seat. No tech Tuesday. Phone free Friday. Or dinner time in general. 3. Talk with your kids about what you expect if you text them. Of course, it depends on their age. But having certain agreements, and those agreements being followed, is a way to build trust and show respect. 4. Remember that reading your child’s texts is like listening into their private conversations. And the older they get, it is important they have their own identity, away from you. Unless you have a good reason to suspect that your teenager is getting into trouble, don’t read them. 5. Make sure your kids understand that even if they think the messages they are sending are private, it just takes a screen grab for that conversation to be shared with others. Tell them the safest thing to do is never write something to someone, no matter who it is, that they wouldn’t be okay with the entire world seeing. This post was originally published on November 15, 2015 and was republished on December 8, 2018.